Recorded in several forms as shown below, this is an Anglo-Saxon, Norman and ultimately Germanic surname. It derives from the personal name Hamo or Hamon, introduced into England after the famous Conquest of 1066, but originally from the pre 5th century Germanic given name "Haimo", meaning "home". 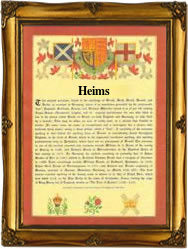 The surname from this source is more familiar as Hammond with a typical English excrescent "d" ending, but it is also found as Hammon, Hame, Haime, and Heim, whilst Haimes, Hames, Haymes, Hamson, Hampson, Heimes, Heims and Heymes are the patronymic forms, meaning "son of Hamon". One Clement Haimes was an early emigrant to the New World; he left London on the "Amitie" in October 1635 bound for St. Christophers in the Barbadoes. Other recordings include: Robert Hamms, the son of John Hamms, christened at St. Thomas the Apostle, London, on September 20th 1584, and Elizabeth Haimes, who married John Brookes at St. James' Church, Duke Street, London, on November 13th 1684. A coat of arms was granted in 1630 being black, on a fess of gold, between three cinquefoils in silver, a lozenge of the field. The first recorded spelling of the family name is shown to be that of Thomas del Hames, which was dated 1332, in the "Subsidy Rolls of Cumberland", during the reign of King Edward 111, known as "The Father of the Navy", 1327 - 1377. Surnames became necessary when governments introduced personal taxation. In England this was known as Poll Tax. Throughout the centuries, surnames in every country have continued to "develop" often leading to astonishing variants of the original spelling.